Are teachers and pupils still short of time for working on computers for educational aims? ASTER is an inexpensive, affordable, and highly efficient solution for educational institutions. 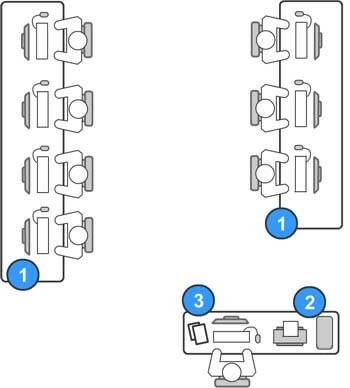 Figure 1.Example of two ASTER 4 in 1 sets application for computerization multiple users of schools and universities, computer. Administration process can be simplified and time saved because only one system unit is being operated. There is no need to install a local network between the stations. 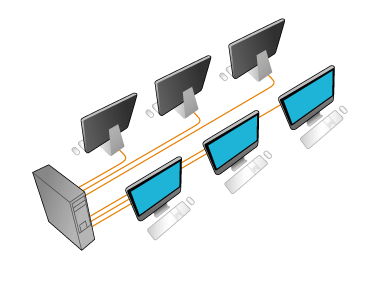 All stations work from the same system bloc, while peripheral devices (e.g., printers) and Internet are automatically accessible from all workstations. Upgrading expenses are reduced to 80%. You will have to upgrade six times less computers than the number of workstations. Electric power can be saved. It is no secret that it is the system unit which consumes the main part of the entire energy supplied to the computer system. Using ASTER, you can cut down on your power consumption. Space is also saved. Absence of extra system blocs makes ASTER very convenient for installation in small rooms and audience halls. Lesser intensity of harmful radiation. The fewer computers there are, the smaller is the high-frequency electromagnetic radiation, which is a health hazard.